These are some of the findings derived from the2019 U.S. Energy and Employment Report (USEER), produced by the Energy Futures Initiative (EFI) in partnership with the National Association of State Energy Officials (NASEO), using data collected and analyzed by BW Research Partnership. The report is available at www.usenergyjobs.org. The greatest number of advanced energy jobs – 2.3 million – are found in energy efficiency, making buildings and appliances use less energy. Energy efficiency jobs grew 3 percent year-over-year. The fastest employment growth was in advanced vehicles, at 15 percent. Of the 253,000 total jobs, 120,900 are associated with plug-in hybrid and all-electric vehicles, which grew 25 percent, and 110,300 with hybrid vehicles, which grew 10 percent. Employment in energy storage increased 14 percent, to 74,500. 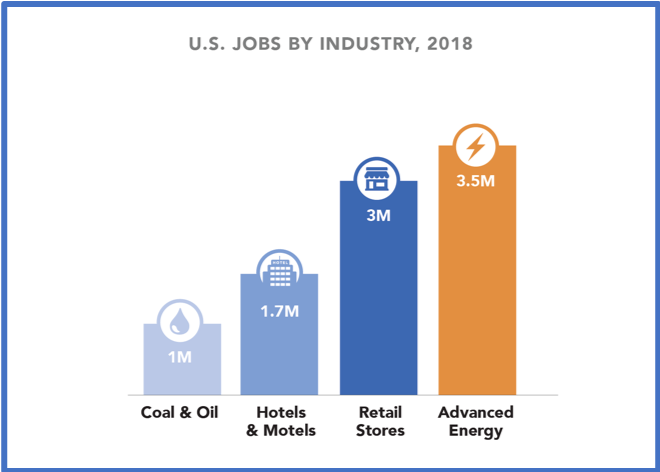 Employment in advanced energy generation – which includes solar, wind, hydro, high-efficiency (combined cycle) natural gas, and nuclear power – totals 695,000 jobs, down 1 percent from 2017. Solar jobs are down 4 percent; wind jobs up 4 percent; advanced (combined cycle) natural gas jobs up 7 percent. Jobs in advanced fuels – which include corn ethanol, biofuels, biomass, and nuclear fuel – increased 11 percent year-over-year, totaling 116,000. Advanced Energy Economy (AEE) is a national association of businesses that are making the energy we use secure, clean, and affordable. Advanced energy encompasses a broad range of products and services that constitute the best available technologies for meeting energy needs today and tomorrow. AEE’s mission is to transform public policy to enable rapid growth of advanced energy businesses. Engaged at the federal level and in more than a dozen states around the country, AEE represents more than 100 companies in the $200 billion U.S. advanced energy industry, which employs 3.5 million U.S. workers. Learn more at www.aee.net and follow the latest industry news @AEEnet.